Hydrogen sulfide (H2S) plays an import role in neuroplasticity; deficiency of H2S is implicated in chronic stress-induced depression. S-adenosylmethionine (SAM) is an agonist of cystathionine β-synthase (CBS), which increases endogenous H2S levels. This present study was designed to investigate the ability of SAM to prevent depression-like behaviors induced by chronic stress and the underlying mechanisms. A mouse model of chronic unpredictable mild stress (CUMS) was adopted to examine the effects of SAM on depression-like behaviors as well as synaptic proteins and synaptic morphology. CUMS induced depression-like behaviors after 2, 4 and 6 weeks as measured by the open field test, sucrose preference test, and forced swimming test. Further, there were significant reductions in endogenous H2S, CBS, and brainderived neurotrophic factor (BDNF) and synapse-associated proteins (synaptophysin, SYN and postsynaptic density protein 95, PSD-95) in the hippocampus of the CUMS group.SAM exposure prevented the effects of CUMS on depressive-like behaviors and the levels of H2S and CBS in the hippocampus. SAM administration also increased BDNF, SYN and PSD-95 in the hippocampus of CUMS mice, and improved the ultrastructure of synapses as examined by electron microscopy. These results demonstrate that SAM exerts antidepressant-like effects in CUMS mice, specifically through enhancing H2S, CBS and neuroplasticity. These findings highlight the novel role of endogenous H2S in mediating antidepressant-like behaviour and its potential for the prevention of chronic stress-induced depression. Depression is the most common neuropsychiatric illness, which brings substantial health and economic burden to society. Its pathogenesis is closely associated with risk factors such asDepression is the most common neuropsychiatric illness, which brings substantial health and economic burden to society. Its pathogenesis is closely associated with risk factors such as chronic stress, especially psychosocial stressors in humans [1-3]. Increasing evidence indicates that major depression is characterized by decreased hippocampal volume, neuronal cell death and reduced neurogenesis in the hippocampus [4,5]. The hippocampus is particularly vulnerable to stress [6,7]. Previous studies show that stress can impair CA1 synaptic plasticity[8, 9]. It is reported that stress exposure induces morphological alterations in the CA1 subregion of the hippocampus, but not in other subregions . Brain-derived neurotrophic factor, also known as BDNF, is widely believed to be involved in the pathophysiological processes of depression [11,12]. For example, BDNF levels are low in the serum of depressive patients, and can be increased after antidepressant therapy [13,14]. Meanwhile, hippocampal BDNF is reduced in mice with depression-like behaviors exposed to chronic unpredictable mild stress (CUMS) . BDNF is also responsible for promoting plasticity in the brain and prevents neuronal damage [13,14]. Notably, the downstream effects of BDNF on synaptic plasticity requires synaptophysin (SYN) and postsynaptic density protein 95 (PSD-95) [16,17], and decreased levels of SYN and PSD-95 are found in the postmortem brain of depression patients [18,19]. Hydrogen sulfide or H2S is an endogenous signaling gasotransmitter , which is essential for regulating diverse biological functions in the central nervous system, e.g. neurotransmission, inflammation, apoptosis and vasodilation [21-23]. Recent studies demonstrate that the disturbance of endogenous H2S generation in the hippocampus is associated with CUMSinduced depression-like behaviors . The H2S donor, NaHS, prevents depression-like behaviors in rodents under CUMS and relieves the symptoms of depression and anxiety in diabetic patients [25,26]. In mammalian cells, endogenous H2S is primarily produced from reactions catalyzed by cystathionine β-synthase (CBS)  and H2S levels can be elevated by the CBS agonist, S-adenosylmethionine (SAM) [28-30]. However, little is known about the ability of SAM to prevent chronic stress-induced depression. Therefore, the current study was designed to firstly examine the effects of SAM on depressive-like behaviors. To further investigate the related biomolecular mechanism, we examined endogenous H2S markers (CBS and H2S), BDNF, and synapse-associated proteins (SYN and PSD-95) in the hippocampus. Adult male Kunming mice weighing 18-22 g were provided by the Experimental Animal Center (Xuzhou Medical University, Xuzhou, Jiangsu, China), and maintained in a temperature and humidity controlled environment with a 12-hour light/dark cycle. The protocol was approved by the Animal Ethics Committee, Xuzhou Medical University, China. All animal experimental procedures were carried out in accordance with the Guide for the Care and Use of Laboratory Animals. The CUMS procedures have been described in our previous work with some modifications . Generally, the mice were subjected to six weeks of unpredictable mild stressors, including 24 hours without food, 24 hours without water, 5-min swimming in cold water (at 4°C), 5-min tail pinch (1.0 cm from the tip of the tail), cage tilting for 24 hours, moisture (200 ml water in 100 g sawdust bedding), immobilization for 4 hours and being illuminated overnight. One hundred and twenty-six mice were randomly divided into three groups (n = 42): control group (without any stress conditions); CUMS group (with CUMS procedure); CUMS + SAM group (with intraperitoneal injection of SAM, 288 mg/kg/day and CUMS procedure). The mice in each group were sacrificed at four time points: at Weeks 0, 2, 4 or 6 during CUMS procedure or/and SAM treatment (n=10-11). The brains were collected to examine the effects of the CUMS procedures and SAM treatment on levels of H2S, CBS, BDNF, SYN, and PSD- 95 in the hippocampus. The behavioral tests were conducted two days before the mice were sacrificed. Open field test: The open field test was performed as previously described to assess locomotor activity . The mice were separately placed in a white open-field square box (40 cm× 40 cm × 40 cm) which was divided into 8 × 8 cm equal squares drawn in the floor. Each mouse was allowed to freely explore for 5 min. All behaviors were recorded using an infrared camera and video system, followed by analysis of the number of crossings and rearings by a mouse behavior analysis system (SLY-ETS, Beijing Shuo Lin Yuan Technology, Beijing, China). Forced swimming test: As previously described , the mice were transferred into glass cylinders (25 cm in height × 20 cm in diameter) filled with water to 10 cm at 25 ± 1°C. The test lasted for 6 min, divided into the pretest period (the first 2 min) and test period (the last 4 min). Mice were considered to be immobile if they held their heads above the water with only slight movements. The immobility time was recorded and later scored by three experimenters who were blind to the experiment design. The fresh hippocampus was homogenized in an ice bath with 9 volumes (w/v) of ice-cold 100 mM PBS buffer (pH 7.4). The resultant homogenate was centrifuged at 12,000 rpm at 4°C for 15 min before determination of hydrogen sulfide in the supernatants. The protein concentrations were measured by a Pierce BCA Protein Assay Kit . The quantity of hydrogen sulfide was determined where the homogenates were spiked with Na2S as an internal standard (X, X + 2, X + 4, X + 6, X + 8 μM), while 69 μl of PBS buffer (100 mM, pH 7.4), and H2O and DMSO were sequentially added. Then, to the supernatants 1.0 μl EPS-HS probe (1.0 mM) was added to reach a final concentration of 10 μM . After incubation at 37°C for 20 min, the emission spectra were measured. The zero point was gained from the addition of 1.0 ml of 100 mM ZnCl2 (at a final concentration of 1.0 mM) to capture H2S in the samples. The calibration curve of Na2S was used to calculate the level of H2S in each sample, with the results expressed as μmol/g protein. The fluorescence measurement was performed on a Hitachi F4600 Fluorescence Spectrophotometer. The dissected hippocampal CA1 tissue (1 mm × 1 mm ×1 mm) was placed in 2.5% glutaraldehyde at 4oC for 4 h, and then rinsed in 0.1 M sodium citrate buffer (pH 7.4) before fixed with 1% osmium tetroxide for 1 h followed by gradient elution. After an overnight infiltration in a mixture of one-half propylene oxide, the tissue was embedded in resin. The resultant tissues were cut into 70 nm-thick slices and stained with 4% uranyl acetate for 20 min and 0.5% lead citrate for 5 min. The ultrastructure of the hippocampal neurons was observed by TEM (TecnaiG2 Spirit Twin). The body weight, sucrose preference, locomotor activity and immobility time were assessed using a two way repeated ANOVA with the CUMS procedure and treatments as the between variables, and time as the within variable. The levels of CBS, H2S, BDNF, SYN and PSD- 95 were analyzed by two-way ANOVA (time x treatment). The time effect and intervention effect were analyzed by Dunnett’s post hoc test. A significant difference was determined when P < 0.05. The statistical analyses were performed using SPSS software version 16.0. The results are expressed as mean ± SEM. The effects of CUMS and SAM treatments on body weight were measured at Weeks 0, 2, 4, and 6 (Figure 1). Two-way repeated measures ANOVA showed that body weight was significantly affected by time (P < 0.001) and treatment (P < 0.05), but there was no interaction between time and treatment (P > 0.05). In the control group, the body weight gradually increased with a significant difference between Week 0 and 6 (P < 0.05), while no significant change in body weight was found in the CUMS group over the 6 weeks. In the CUMS + SAM group, body weight was significantly increased at Weeks 4 and 6 of treatment compared with that at Week 0 (P<0.05). Compared with the control, body weight of the CUMS group was significantly lower at Weeks 4 and 6 (both P < 0.05); SAM treatment restored this with the CUMS+SAM group showing remarkable increases in body weight at Weeks 4 and 6 compared to the CUMS group (both P < 0.05) and no difference compared to the controls. Figure 1b: SAM prevents CUMS-induced suppression of body weight in mice. #P < 0.05 vs Week 0 within the groups. **P < 0.05 vs the control group at the same time point; & P < 0.05 vs the CUMS group at the same time point. CUMS: chronic unpredictable mild stress; SAM: S-adenosylmethionine. Date are reported as mean ± SEM (n=10-11). Two-way repeated measures ANOVA indicated that sucrose preference was significantly affected by time and treatment (both P < 0.01), and an interaction between time and treatment (P < 0.01) (Figure 2). In the CUMS group (but not the control or CUMS+SAM groups), the percentage of sucrose consumption significantly decreased at Weeks 2, 4 and 6 in comparison with that at Week 0 (all P < 0.05). Furthermore, the CUMS group showed lower sucrose consumption at Weeks 2, 4 and 6 than the control group (P < 0.05). 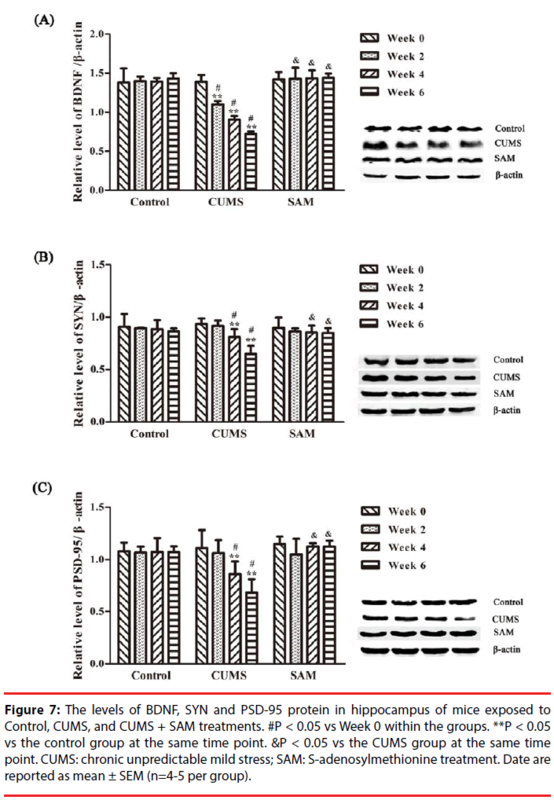 SAM treatment prevented the CUMS-induced reductions in sucrose consumption at Weeks 4 and 6 (both P < 0.05), with the CUMS+SAM group showing no difference compared to control across all weeks (P > 0.05). Figure 2: SAM improves sucrose preference in CUMS mice. #P < 0.05 vs Week 0 within the groups. **P < 0.05 vs the control group at the same time point. &P < 0.05 vs the CUMS group at the same time point. CUMS: chronic unpredictable mild stress; SAM: S-adenosylmethionine treatment. Date are reported as mean ± SEM (n=10-11). The effects of CUMS and SAM treatment on locomotor activity were measured at Weeks 0, 2, 4, and 6 though the open field test (Figure 3). Two-way repeated measures ANOVA indicated that the number of crossings and rearings were significantly affected by the treatments (P < 0.001) and time (P < 0.01) (Figure 3A, 3B). The number of crossings and rearings significantly decreased at Weeks 2, 4 and 6 compared with that at Week 0 in the CUMS group (all P < 0.05), but not in the control and CUMS+SAM groups (all P > 0.05). Furthermore, SAM treatment prevented the CUMS-induced reductions in the number of crossings and rearings at Weeks 2, 4 and 6 (all P < 0.05), with the CUMS+SAM group showing no difference compared to control (P > 0.05). Figure 3: The number of crossing and rearings of mice exposed to Control, CUMS, and CUMS + SAM treatments in the open-field test. (A) The number of crossings. (B) The number of rearings. #P < 0.05 vs Week 0 within the groups. **P < 0.05 vs the control group at the same time point. &P < 0.05 vs the CUMS group at the same time point. CUMS: chronic unpredictable mild stress; SAM: S-adenosylmethionine treatment. Date are reported as mean ± SEM (n=10-11). The effect of CUMS and SAM treatment on immobility time was examined in the forced swimming test at Weeks 0, 2, 4, and 6 (Figure 4). Immobility time was significantly affected by the interaction between the treatment and time (P < 0.001). In the CUMS group, the immobility time markedly increased at Weeks 4 and 6 compared with Week 0 (both P < 0.05). The immobility time at weeks 4 and 6 were longer in the CUMS group compared with the control group (both P < 0.05). The immobility time significantly decreased in the CUMS+SAM group at week 4 and week 6 compared with the CUMS group (both P < 0.05), with the CUMS+SAM group showing no difference compared to control (P > 0.05). 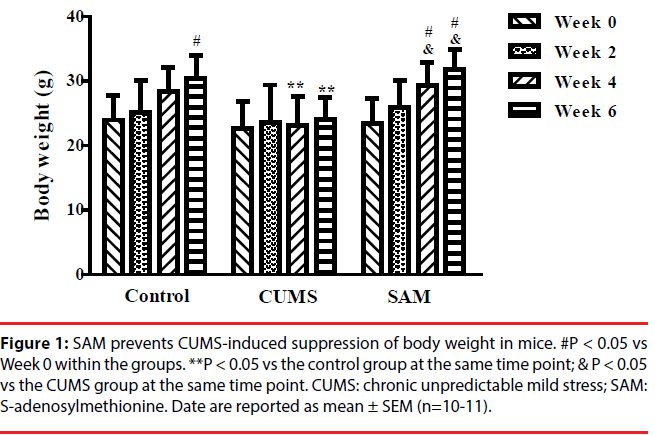 Figure 4: The immobility of mice exposed to Control, CUMS, and CUMS + SAM treatments in the forced swimming test. #P < 0.05 vs Week 0 within the groups. **P < 0.05 vs the control group at the same time point. &P < 0.05 vs the CUMS group at the same time point. CUMS: chronic unpredictable mild stress; SAM: S-adenosylmethionine treatment. Date are reported as mean ± SEM (n=10-11). The effects of CUMS and SAM treatments on the level of CBS protein were detected by Western blotting (Figure 5). Two-way ANOVA indicated that the levels of CBS protein were significantly affected over time (P < 0.001) and there was an interaction effect between time and treatment (P < 0.001). In the CUMS group, the levels of CBS were significantly decreased at Weeks 2, 4 and 6 compared with that at Week 0 (all P < 0.05). Furthermore, a significant reduction in CBS levels was observed in the CUMS group compared with the control at Weeks 4 and 6 (both P < 0.05). A combined use of CUMS and SAM resulted in marked increases in CBS level compared with CUMS treatment alone at Weeks 4 and 6 (both P < 0.05), with the CUMS+SAM group showing no difference compared to control (P > 0.05). 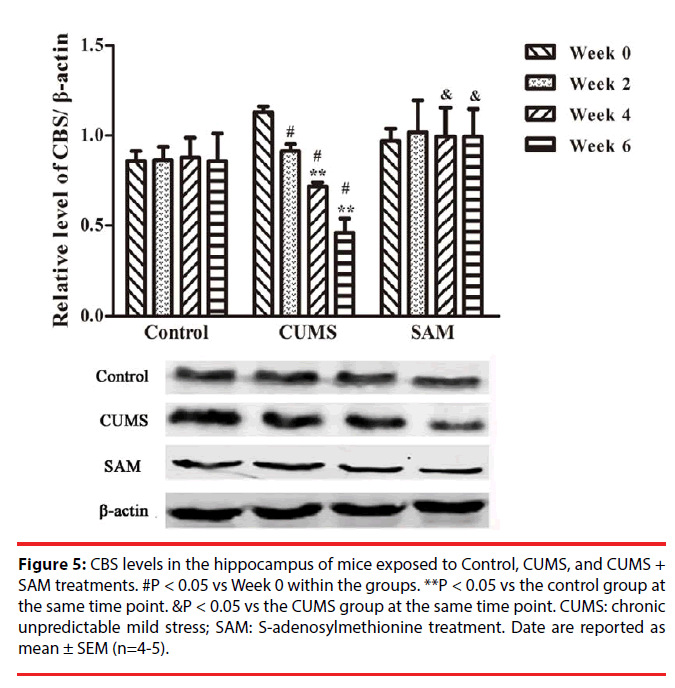 Figure 5: CBS levels in the hippocampus of mice exposed to Control, CUMS, and CUMS + SAM treatments. #P < 0.05 vs Week 0 within the groups. **P < 0.05 vs the control group at the same time point. &P < 0.05 vs the CUMS group at the same time point. CUMS: chronic unpredictable mild stress; SAM: S-adenosylmethionine treatment. Date are reported as mean ± SEM (n=4-5). Next we explored whether SAM was able to affect endogenous H2S production in the hippocampus. The levels of hippocampal H2S were examined at Weeks 0, 2, 4, and 6, using the fluorescent probe EPS-HS  which can monitor H2S sensitivity in cells or animals (Figure 6). Two-way ANOVA indicated that the levels of endogenous H2S were significantly affected by the interaction between the treatment groups and time (P < 0.001). In the CUMS group, the levels of endogenous H2S were decreased at Weeks 2, 4 and 6 (all P < 0.05) compared with that at Week 0. Furthermore, the CUMS group produced significantly lower levels of endogenous H2S than the control group at Weeks 2, 4 and 6 (all P < 0.05). However, the levels of endogenous H2S were remarkably increased in the CUMS+SAM group compared with those in the CUMS group at Weeks 2, 4 and 6 (all P < 0.05), with the CUMS+SAM group showing no difference compared to control (P > 0.05). Figure 6: H2S levels in hippocampus of mice exposed to Control, CUMS, and CUMS + SAM treatments. #P < 0.05 vs Week 0 within the groups. **P < 0.05 vs the control group at the same time point. &P < 0.05 vs the CUMS group at the same time point. CUMS: chronic unpredictable mild stress; SAM: S-adenosylmethionine treatment. Date are reported as mean ± SEM (n=4-5). The levels of BDNF, SYN and PSD-95 in the control, CUMS and CUMS+SAM groups were measured by Western blotting at Weeks 0, 2, 4, and 6 (Figure 7). Two-way ANOVA indicated that the level of BDNF was significantly affected by time (P = 0.001) and the interaction between time and treatment (P < 0.001). As shown in Figure 7, the CUMS group presented significantly decreased levels of BDNF at Weeks 2, 4 and 6 (all P < 0.05), and SYN and PSD-95 at Weeks 4 and 6 (P < 0.05 or P < 0.01) compared with those at Week 0. Furthermore, marked decreases were detected in the levels of BDNF at Weeks 2, 4 and 6, SYN and PSD-95 at Weeks 4 and 6 in the CUMS group in comparison with the control (all P < 0.05). Exposure to both CUMS and SAM resulted in significantly higher levels of BDNF at Weeks 2, 4 and 6, and higher SYN and PSD-95 at Weeks 4 and 6 compared to CUMS treatment alone (P < 0.05 or P < 0.01). Figure 7: The levels of BDNF, SYN and PSD-95 protein in hippocampus of mice exposed to Control, CUMS, and CUMS + SAM treatments. #P < 0.05 vs Week 0 within the groups. **P < 0.05 vs the control group at the same time point. &P < 0.05 vs the CUMS group at the same time point. CUMS: chronic unpredictable mild stress; SAM: S-adenosylmethionine treatment. Date are reported as mean ± SEM (n=4-5 per group). Next, the neuronal ultrastructure of synapses was examined using transmission electron microscopy at Week 6. The control group presented integrated structures of presynaptic and postsynaptic membranes, and the synaptic cleft was clear in the hippocampal CA1 regions (Figure 8A). In contrast, in the CUMS group, the presynaptic and postsynaptic membranes were ruptured, while the synaptic cleft was widened and the postsynaptic density tended to thin (Figure 8B). Furthermore, in the CUMS+SAM group, the synaptic structure was improved with narrower synaptic clefts and thicker postsynaptic densities compared with the CUMS group (Figure 8C). Figure 8: TEM images of the hippocampal CA1 fields of mice exposed to Control, CUMS, and CUMS + SAM treatments. (A) The structures of the presynaptic and postsynaptic membranes are integrated, while the synaptic cleft is clear in the hippocampus CA1 of mice. (B) The presynaptic and postsynaptic membranes are ruptured, the synaptic cleft is widened (black arrow) and the postsynaptic density becomes thin (red arrow) in the hippocampus CA1 regions of CUMS mice. (C) The synaptic cleft become narrow (black arrow) and the postsynaptic density is thick (red arrow) in the hippocampus CA1 of mice after SAM treatment. (Scale bars = 500 nm). In the current study, SAM ameliorated the depression-like behaviors, including anhedonia, hypolocomotor activity and hypomotility, in a mouse model of chronic unpredictable mild stress. The most important finding is that SAM was able to prevent the decline of CBS, H2S, BDNF, SYN and PSD-95 levels in the hippocampus of CUMS mice. These biochemical alterations were accompanied by an improvement in synaptic ultrastructure after SAM administration. The CUMS mice in the present study exhibited depression-like behaviors, such as anhedonialike behavior in the sucrose preference test, anxiety-like behavior and decreased exploration in the open field test, and immobility in the forced swimming test, after two or four weeks of CUMS procedures. Notably, previous studies reported a reduction in hippocampal H2S levels in CUMS rats examined by the N,N-dimethylp- phenylenediamine sulfate (NNDPD) method . Based on a novel fluorescent probe method in the current study, we confirmed that endogenous H2S levels were decreased in the CUMS depression mouse model . As this finding was accompanied by a reduction in the H2S synthesizing enzyme, CBS, this suggests CBS could provide a novel therapeutic target to prevent H2S decline in stress-induced depression. SAM, an agonist of CBS, is a natural substance synthesized from the amino acid L-mehtionine and adenosine triphosphate through the l-carbon cycle . Several randomized clinical trials have supported the efficacy of SAM as an antidepressant [35,36]. In the present study, SAM administration prevented CUMS-induced depression-like behaviors in mice, including anhedonia-like behavior, hypolocomotor activity and immobility. Furthermore, exposure to SAM was able to relieve the decline in the level of CBS and endogenous H2S in the hippocampus during the progression of CUMS-induced depression in mice. Therefore, these findings reveal an antidepressant-like action of SAM and a potential underlying mechanism of H2S production. A reduction in BDNF has been considered to be associated with the pathogenesis of depression [37-39]. For example, BDNF expression is decreased in the hippocampus of depressed suicidal patients, while BDNF immunoreactivity is increased in the hippocampus of patients receiving antidepressants [40,41]. Hippocampal administration of BDNF induces antidepressantlike behavioral effects in rats . Previously, the exogenous H2S donor, NaHS, was able to significantly elevate the level of hippocampal BDNF in mice with homocysteine-induced Alzheimer-like dysfunction . According to the present study, SAM prevented CUMS-induced BDNF decline in the hippocampus, which may be through increasing the levels of H2S and CBS. Overall, these results demonstrated that SAM-induced H2S production may ameliorate chronic stress-induced depression through increasing BDNF expression. Dysregulation of synaptic plasticity in the hippocampus has been implicated in chronic stress or depression . SYN and PSD-95, synapse-associated proteins, are important for synaptic plasticity . Reduction in both SYN and PSD-95 protein levels was found in the hippocampus of patients with major depression . In the present study, the levels of hippocampal SYN and PSD-95 were decreased in CUMS mice, which may contribute to the molecular mechanism of chronic stress-induced depressive behaviors. Antidepressants, such as fluoxetine and tranylcypromine, increased SYN mRNA expression in the hippocampus of rats with depressive behaviors . In the present study, SAM treatment prevented the reduction of SYN and PSD-95 protein levels in the hippocampus of CUMS mice. The expression of SYN and PSD-95 has been reported to be dependent on BDNF processing [16,48]. Therefore, these neurochemical findings suggest that the antidepressive effects of SAM, may be due to its capability of increasing BDNF and the synapse-associated proteins and thus improve the depressive-like behaviors in mice. Given the effect of stress on CA1 synaptic plasticity [8,9], we examined the synaptic ultrastructure of the CA1 region. It is reported that stress results in structural remodelling and loss of axo-spinous synapses in electron microscopic studies [49,50]. However, whether the changes of neuronal synaptic ultrastructure are associated with depression-like behaviors is still unknown. Studies have however correlated hippocampal expression of synaptic marker molecules with depression-behaviour [51,52]. In the present study, the reduction in synaptic proteins may be responsible for the ultra- structural changes such as ruptured presynaptic and postsynaptic membranes, widened synaptic cleft and decreased postsynaptic density in the CUMS mice. More importantly, SAM prevented this CUMS-induced alteration of synaptic ultrastructure as well as reduction in the synaptic proteins, synaptophysin and PSD-95. Therefore, improvement in these synaptic -associated proteins may underlie changes in the ultrastructure of synapses associated with depression. In this study, endogenous H2S and its synthesising enzyme, CBS, as well as BDNF and synapse-associated proteins were gradually reduced in the hippocampus of mice during the procedure of chronic unpredictable mild stress. Importantly, the administration of SAM (a CBS agonist) showed antidepressant-like effects in this CUMS-induced depression mouse model. Furthermore SAM increased hippocampal H2S, CBS, BDNF and synapse-associated proteins (SYN and PSD95) in the CUMS mice. These results demonstrate that SAM may be a promising novel candidate to improve chronic stress-induced depression via improvement of endogenous H2S and CBS and neuroplasticity. These findings also provide novel insight into the mechanism underlying endogenous H2Smediated antidepressant-like behaviors for the prevention of chronic stress-induced depression. The exact mechanisms underlying the effects of H2S on BDNF or synaptic proteins are unclear. It is found that NaHS (H2S donor) decreases the ROS levels in PC12 cells  and the modulation of ROS levels plays a role in the protein content and expression of BDNF. For example, suppression of ROS by antioxidants increases BDNF and SYN levels in the retina and CA1 of diabetic animals [54,55]. Further studies are required to determine whether SAM (endogenous H2S) could target ROS for improving the CUMS-induced reduction of BDNF, synapse-associated protein levels and synaptic ultrastructure. YL, JR, XL and ALG and designed research; XL, JR and TYF conducted research; XL, YPP, and XY analyzed data; YL, XL, KAN, YHY, and XFH wrote the manuscript. This work was supported by the National Natural Science Foundation of China (81671069 to Y. L.), Key Laboratory of Nuclear Medicine of Ministry of Health of China (KF201503), the Graduate Student Innovation Project in Jiangsu Province (No.KYLX16_1140), Xuzhou Innovation of Science and Technology Special Project (No. KC16SW164). The experiment of electron microscopy for structural analysis in this article was completed in Research Facility Center for Morphology of Xuzhou Medical University, and we thank Prof. Hongyan Dong for her support on the analysis of electron microscopy. Gold PW. The organization of the stress system and its dysregulation in depressive illness. Mol. Psychiatry 20(1), 32 (2015). Hill MN, Hellemans KG, Verma P, et al. Neurobiology of chronic mild stress, Parallels to major depression. Neurosci. Biobehav. Rev 36(9), 2085-2117 (2012). Kiyohara C, K Yoshimasu. Molecular epidemiology of major depressive disorder. Environ. Health Prev. Med 14(2), 71-87 (2009). Bremner JD, Narayan M, Anderson ER, et al. Hippocampal volume reduction in major depression. Am. J. Psychiatry 157(1), 115-118 (2000). Lee AL, WO Ogle, RM Sapolsky. Stress and depression, possible links to neuron death in the hippocampus. Bipolar. Disord 4(2), 117-128 (2002). Lee V, MacKenzie G, Hooper A, et al. Reduced tonic inhibition in the dentate gyrus contributes to chronic stress-induced impairments in learning and memory. Hippocampus 26(10), 1276-1290 (2016). van der Kooij MA, Fantin M, Kraev I, et al. Impaired Hippocampal Neuroligin-2 Function by Chronic Stress or Synthetic Peptide Treatment is Linked to Social Deficits and Increased Aggression. Neuropsychopharmacology 39(5), 1148-1158 (2014). Tomar A, Polygalov D, Chattarji S, et al. The dynamic impact of repeated stress on the hippocampal spatial map. Hippocampus 25(1), 38-50 (2015). Alfarez DN, M Joëls, HJ Krugers. Chronic unpredictable stress impairs long‐term potentiation in rat hippocampal CA1 area and dentate gyrus in vitro. Eur. J. Neurosci 17(9), 1928-1934 (2015). Iñiguez SD, Aubry A, Riggs LM, et al. Social defeat stress induces depression-like behavior and alters spine morphology in the hippocampus of adolescent male C57BL/6 mice. Neurobiol. Stress 5(C), 54-64 (2016). Hosang GM, Shiles C, Tansey KE, et al. Interaction between stress and the BDNF Val66Met polymorphism in depression, a systematic review and meta-analysis. J. Thromb. Haemost 12(1), 199-200 (2014). Murakami S, Imbe H, Morikawa Y, et al. Chronic stress, as well as acute stress, reduces BDNF mRNA expression in the rat hippocampus but less robustly. J. Neurosci. Res 53(2), 129-139 (2005). Chen B, Dowlatshahi D, MacQueen GM, et al. Increased hippocampal BDNF immunoreactivity in subjects treated with antidepressant medication. Biol. Psychiatry 50(4), 260-265 (2001). Liu Y, Lan N, Ren J, et al. Orientin improves depression-like behavior and BDNF in chronic stressed mice. Mol. Nutr. Food. Res 59(6), 1130-1142 (2015). Li W, Keifer J. Rapid enrichment of presynaptic protein in boutons undergoing classical conditioning is mediated by brain-derived neurotrophic factor. Neuroscience 203(1), 50-58 (2012). Robinet C, Pellerin L. Brain-derived neurotrophic factor enhances the hippocampal expression of key postsynaptic proteins in vivo including the monocarboxylate transporter MCT2. Neuroscience 192(1), 155-163 (2011). Feyissa AM, Chandran A, Stockmeier CA, et al. Reduced levels of NR2A and NR2B subunits of NMDA receptor and PSD-95 in the prefrontal cortex in major depression. Prog. Neuropsychopharmacol. Biol. Psychiatry 33(1), 70-75 (2009). Reinés A, Cereseto M, Ferrero A, et al. Maintenance Treatment with Fluoxetine is Necessary to Sustain Normal Levels of Synaptic Markers in an Experimental Model of Depression, Correlation with Behavioral Response. Neuropsychopharmacology 33(8), 1896 (2008). Wang R. Gasotransmitters, growing pains and joys. Trends. Biochem. Sci 39(5), 227–232 (2014). Lefer DJ. A new gaseous signaling molecule emerges, cardioprotective role of hydrogen sulfide. Proc. Natl. Acad. Sci U S A 104(46), 17907 (2007). Olson KR. The therapeutic potential of hydrogen sulfide, separating hype from hope. Am. J. Physiol. Regul. Integr. Comp. Physiol 301(2), R297 (2011). Hu LF, Lu M, Hon Wong PT et al. Hydrogen sulfide, neurophysiology and neuropathology. Antioxid Redox Signal 15(2), 405 (2011). Tan H, Zou W, Jiang J, et al. Disturbance of hippocampal H2S generation contributes to CUMS-induced depression-like behavior, involvement in endoplasmic reticulum stress of hippocampus. Acta. Biochimica. Et. Biophysica. Sinica 47(4), 285-291 (2015). Chen WL, Xie B, Zhang C, et al. Antidepressant-like and anxiolytic-like effects of hydrogen sulfide in behavioral models of depression and anxiety. Behav Pharmacol 24(7), 590 (2013). Tang ZJ, Zou W, Yuan J, et al. Antidepressant-like and anxiolytic-like effects of hydrogen sulfide in streptozotocin-induced diabetic rats through inhibition of hippocampal oxidative stress. Behav. Pharmacol 26(5), 427-435 (2015). Stein A, Bailey SM. Redox biology of hydrogen sulfide, Implications for physiology, pathophysiology, and pharmacology. Redox Biol 1(1), 32-39 (2013). Prudova A, Bauman Z, Braun A, et al. S-adenosylmethionine stabilizes cystathionine beta-synthase and modulates redox capacity. Proc. Natl. Acad. Sci 103(17), 6489 (2006). Eto K, Kimura H, The production of hydrogen sulfide is regulated by testosterone and S -adenosyl- l -methionine in mouse brain. J. Neurochem 83(1), 80-86 (2002). Dziegelewska M, Holtze S, Vole C, et al. Low sulfide levels and a high degree of cystathionine β-synthase (CBS) activation by S-adenosylmethionine (SAM) in the long-lived naked mole-rat. Redox Biol 8, 192-198 (2016). Zhang L, Meng WQ, Lu L, et al. Selective detection of endogenous H2S in living cells and the mouse hippocampus using a ratiometric fluorescent probe. Sci. Rep 4, 5870 (2014). Y Liu, Y Ding, J Huang, et al. A benzothiazole-based fluorescent probe for selective detection of H 2 S in living cells and mouse hippocampal tissues. Dyes. Pigm 138, 112-118 (2017). Fu X, Zhang J, Guo L, et al. Protective role of luteolin against cognitive dysfunction induced by chronic cerebral hypoperfusion in rats. Pharmacol. Biochem. Behav 126, 122-130 (2014). Spillmann M, MFava. S -Adenosylmethionine (Ademetionine) in Psychiatric Disorders. CNS. Drugs 6(6), 416-425 (1996). Papakostas GI, Alpert JE, Fava M. S-adenosyl-methionine in depression, a comprehensive review of the literature. Curr. Psychiatry. Rep 5(6), 460 (2003). Papakostas GI. Evidence for S-adenosyl-L-methionine (SAM-e) for the treatment of major depressive disorder. J. Clin. Psychiatry 70(5), 18-22 (2009). Kalueff AV, Avgustinovich DF, Kudryavtseva NN, et al. BDNF in anxiety and depression. Science 312(5780), 1598 (2006). Martinowich K, Manji H, Lu B. New insights into BDNF function in depression and anxiety. Nat. Neuroscience 10(9), 1089 (2007). Hashimoto K. Depression and BDNF. Nihon. Yakurigaku. Zasshi. Folia. Pharmacologica. Japonica 127(3), 201-204 (2006). Dwivedi Y, Rizavi HS, Conley RR, et al. Altered gene expression of brain-derived neurotrophic factor and receptor tyrosine kinase B in postmortem brain of suicide subjects. Arch. Gen. Psychiatry 60(8), 804 (2003). Chen B, Dowlatshahi D, MacQueen GM et al. Increased hippocampal bdnf immunoreactivity in subjects treated with antidepressant medication. Biol. Psychiatry 50(4), 260 (2001). Shirayama Y, Chen AC, Nakagawa S, et al. Brain-Derived Neurotrophic Factor Produces Antidepressant Effects in Behavioral Models of Depression. J. Neurosci 22(8), 3251 (2002). Kamat PK, Kyles P, Kalani A, et al. Hydrogen Sulfide Ameliorates Homocysteine-Induced Alzheimer’s Disease-Like Pathology, Blood–Brain Barrier Disruption, and Synaptic Disorder. Mol. Neurobiol 53(4), 2451-2467 (2016). Christoffel DJ, Golden SA, Russo SJ. Structural and synaptic plasticity in stress-related disorders. Rev. Neurosci 22(5), 535 (2011). Jiang Y, Liu Y, Zhu C, et al. Minocycline enhances hippocampal memory, neuroplasticity and synapse-associated proteins in aged C57 BL/6 mice. Neurobiol Learn Mem 121, 20-29 (2015). Han K, Kim E. Synaptic adhesion molecules and PSD-95. Prog. Neurobiol 84(3), 263-283 (2008). Rapp S, Baader M, Hu M, et al. Differential regulation of synaptic vesicle proteins by antidepressant drugs. Pharmacogenomics. J 4(2), 110-113 (2004). Robinet C, Pellerin L, Brain-derived neurotrophic factor enhances the hippocampal expression of key postsynaptic proteins in vivo including the monocarboxylate transporter MCT2. Neuroscience 192(1), 155 (2011). Hajszan T, Dow A, Warner-Schmidt JL, et al. Remodeling of hippocampal spine synapses in the rat learned helplessness model of depression. Biol. Psychiatry 65(5), 392 (2009). Donohue HS, Gabbott PL, Davies HA, et al. Chronic restraint stress induces changes in synapse morphology in stratum lacunosum-moleculare CA1 rat hippocampus, a stereological and three-dimensional ultrastructural study. Neuroscience 140(2), 597 (2006). Iwata M, Shirayama Y, Ishida H, et al. Hippocampal synapsin I, growth-associated protein-43, and microtubule-associated protein-2 immunoreactivity in learned helplessness rats and antidepressant-treated rats. Neuroscience 141(3), 1301-1313 (2006). Reinés A, Cereseto M, Ferrero A, et al. Maintenance treatment with fluoxetine is necessary to sustain normal levels of synaptic markers in an experimental model of depression, correlation with behavioral response. Neuropsychopharmacology 33(8), 1896-908 (2008). Jiang JM, Zhou CF, Gao SL, et al. BDNF-TrkB Pathway Mediates Neuroprotection of Hydrogen Sulfide against Formaldehyde-Induced Toxicity to PC12 Cells. Plos. One 10(3), e0119478 (2015). Sasaki M, Ozawa Y, Kurihara T, et al. Neurodegenerative influence of oxidative stress in the retina of a murine model of diabetes. Diabetologia 53(5), 971-979 (2010). Wang X, Zhao L. Calycosin ameliorates diabetes-induced cognitive impairments in rats by reducing oxidative stress via the PI3K/Akt/GSK-3β signaling pathway. Biochem. Biophys. Res. Commun 473(2), 428 (2016).